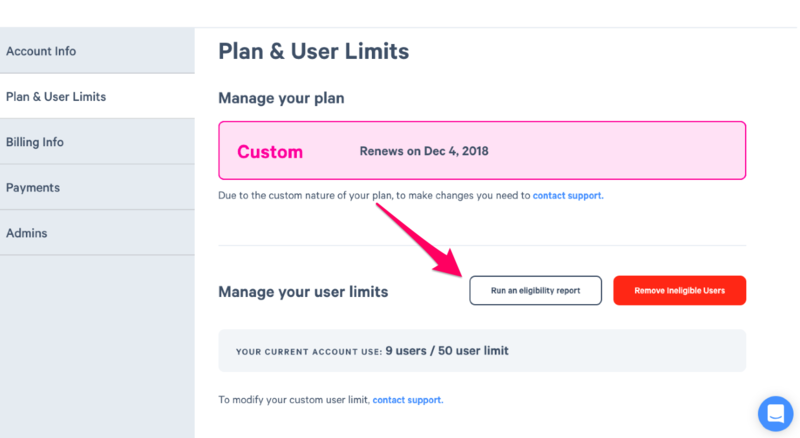 Please note: this button will only be visible to you if your subscription includes Eligibility and your client success representative has worked with you to set up this feature. 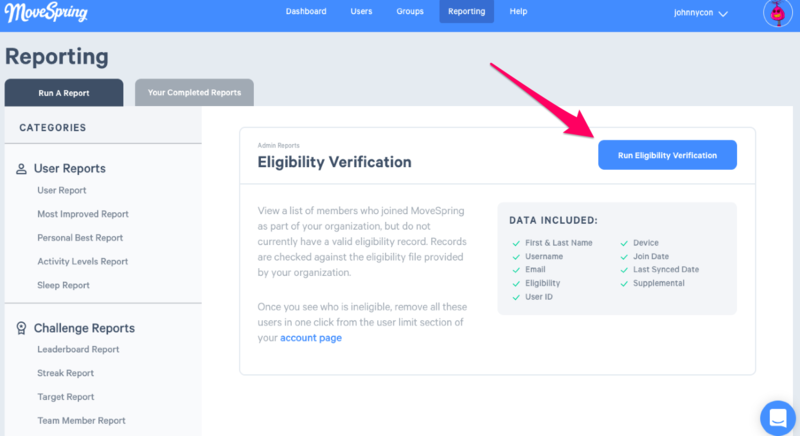 Organizations can use an eligibility file to manage access to MoveSpring. 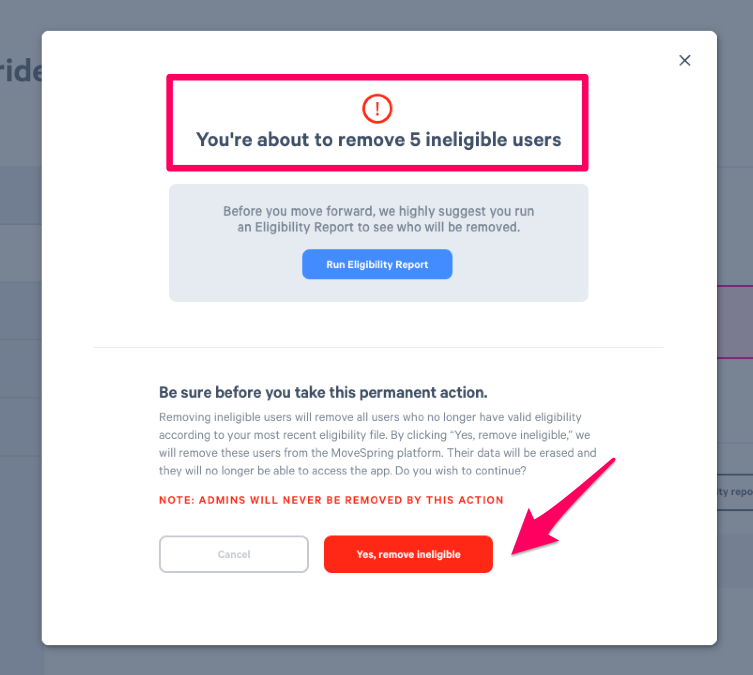 Removing ineligible users will remove users who no longer have valid eligibility according to your most recent eligibility file. This will delete the MoveSpring account of all ineligible users, and they will not be able to re-create their account. This is a final action and cannot be undone. Head to the Reporting tab and pull an Eligibility Verification report first to make sure these are the users you would like removed. If you have not updated your eligibility file please reach out to your client success representative first. 1. Navigate to the admin center and login using your MoveSpring credentials. 2. Click your username at the top right, and select "Account Settings"
4. Click "Run an eligibility report"
** We highly suggest naming your report so that it's easily accessible as your browsing through your reports in the future. 7. Download excel report and verify correct # of users will be removed. Important note: If anything looks incorrect with this report or a number seems off, please contact your dedicated client success manager before moving forward with step 8. Scroll back up to follow steps 1 - 3 to get back to the correct page. 9. Click the orange button "Remove Ineligible Users"
9. You'll see a warning message notifying you that you're about to remove x number of users from your client account. If this is correct, select "Yes, remove ineligible" to continue. 10. Select "Confirm and remove". 11. You'll see a message pop up at the bottom left letting you know that process is started. Waiting time will vary depending on the size of your group. 12. 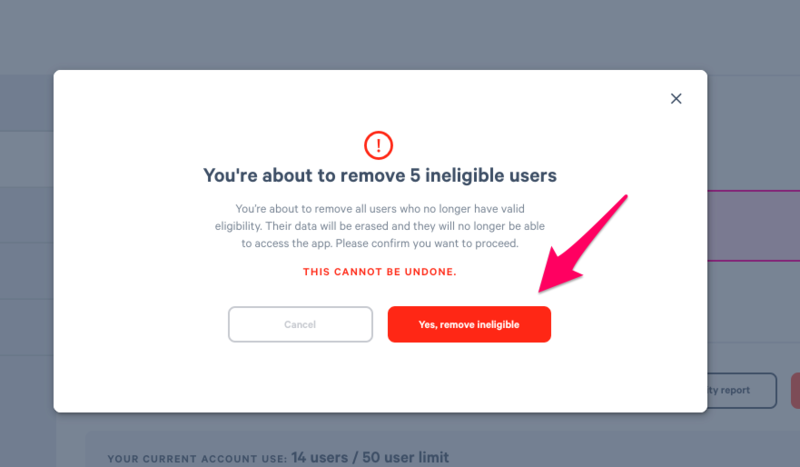 Once completed you'll see another pop-up message at the bottom right to confirm that all ineligible users have been removed. For convenience, admin accounts cannot be removed through this process. If a user currently has admin access they will need to be removed from the account manually. If you have any questions please reach out to your client success manager via email.